In this disconnected world, as friendships change with time and distance, it’s easy for any of us to fear being unknown – if I went away, would anyone notice? Everyone is so busy, so involved in their own lives – if I disappeared, would it even matter? The next morning, I woke to find an email from my next door neighbor. He was leaving town that day, and his dog-sitter had fallen through. Could I take care of his 140 lb. 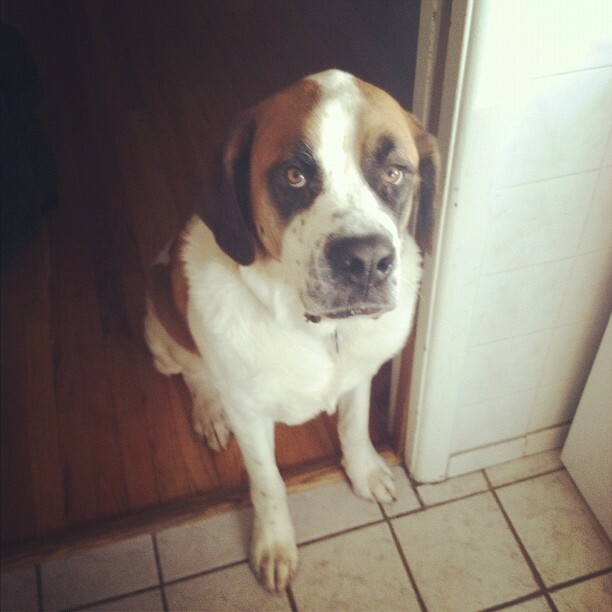 St. Bernard, Bo? Over the years, as my income has slowly increased, I’ve found that so has my autonomy. A ride to the airport? No thanks, I’ll just pay for parking. Borrow a dress for a wedding? It’s okay, I’ll buy my own. Need help moving? I’m alright, I’ll just hire movers. Post-college, increasingly more so year after year, I’ve found that we seem to need each other less and less. Independence is all well and good – but at what point does our self-sufficiency actually do us a disservice? At what point does our maverick mindset lead to a lonely detachment? And when does our relational disconnect actually deprive someone else of being seen, being noticed, being needed? I said yes to taking care of Bo. It was the smallest thing – feeding him, letting him out a couple of times, taking him on a walk which I would have gone on anyway. Arriving at the front door and having him shove his massive head into my hands for some love was the highlight of that day and a half – and for those 36 hours, I felt needed. I felt connected. I felt seen. The next time I need help, I’m going to ask for it. Who knows – someone might need me more than I need them. “If I disappeared would it even matter?” — I wonder this about myself far too often. Ugh. But I hope our emails this week proved that you matter so much and, with most of my close friends scattered around the country, how vital our connection still is to me. Love you (and that dog!). Believe me, dear heart, if you disappeared, a TON of people would notice, and we would all be the worse for it! I made my first friend in my new town when she asked me if she could borrow a dress for a wedding. It’s a good idea. It’s like you crawled inside my brain just then. Even though i may not let you know, you are consistently on my mind, and, well, we don’t need to talk about my dreams. Welcome to the reason i decided to write again. you are my hero. not surprising, i dog sat this weekend for an amazing pup! i’m glad you were able to connect & share your love with one who was all too excited to receive it and who effortlessly and unhesitatingly reciprocated. I feel like I’m in a similar place as you, Annie. It is nice to be known. I do know that I can’t wait to see you for Greta’s wedding festivities! I don’t know what else to say except exactly, precisely, completely how I feel today. Your words echo what is in my heart right now… I can feel quite alone in the midst of many. Thanks for putting words to this feeling. Sending friendly thoughts from California. I love this post Annie. I struggle with independence vs community too, and this was what I needed to read today.